I’m sure you’ll hear my Junkrat cosplay friend use this one a lot at the next con she pops up at. Send it to blizzard, maybe they will put it in! Sent it to Blizzard. With Coelasquids name on it. You should submit this line to Blizzard, I bet you could get them to use it. Nice comic Kelly! I didn’t know Junkrat was a dad. You don’t HAVE to be a dad to make dad-jokes. You just don’t have an excuse to do so otherwise. I just remembered he had a peg leg. New cosplay if I ever loose a leg. And junkrat thinks he can be inconspicuous in a disguise with that peg leg. A large part of me is hoping that this means that peg legs are incredibly common in junkertown due to wild drop bear attacks. Or possibly thats why he got exiled (for blowing off everyones legs). He could wear pants and a cap on the end that looks like a shoe or boot. His leg being able to bend helps that a lot. On one hand, it’s cool to have a character that works well for cosplayers with a disability. On the other hand, why wait? I’ve seen a cosplayer who covered up their foot with a mock Trap Mine and had the peg leg resting on that. Looked like it worked pretty well. That sounds like it could get very uncomfortable very quickly. Or worse. If I ever lose a leg I’m cosplaying as Reinhardt because **** typecasting. Roadhog looks more ripped than usual. Must be working out. He’s also not in danger of a sudden wardrobe malfunction. I thought it was accepted at this point that uses explosives for daily tasks. Shaving? Flamethrower. Mowing the lawn? Land mines. Bathing? Bath bombs. I think Popular Mechanics postulated once the usabilty of dynamite to plow land. Even Crocodile Dundee knows the utility of dynamite to go fishing. Yeah, and judging by his sanity, his bath bombs are full of bath salts. Just before the last panel Junkrat used his exploding wheel on a wild Bastion that suddenly appeared. 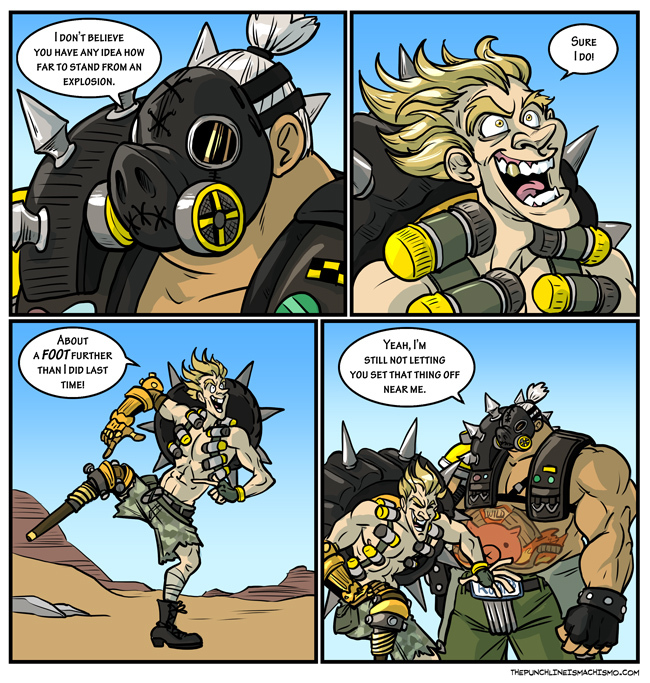 For those of you reading this comment who didn’t see the comic on Monday, when it wasn’t colored yet: the non-colored version of this comic was missing Junkrat’s wheel in the last panel. Figuring out that safe distance cost him an arm and a leg. It’s one of those things that ring “but of course, its so evident!” That no one notices. Oh and Roadhog more… Beefy😁? I always thought of him as more weightlifter than bodybuilder material.IMBWT. I need to see that second panel of crazed-Junkrat in Heath-Ledger-Joker styling. It’s perfect. The ultimate weight loss diet called the foot long gone. If he only lost his foot, then it wasn’t the explosion that did the damage – it was flying debris, in which case a single foot can make all the difference. Or good cover. Well he lost an arm on the same side, but we don’t actually know if both of those limb removals happened in the same explosion. Though if he DID lose them both at the same time, I’m not sure debris can explain them both. He probably lost the arm doing what I would do to try to set off an explosive….poke it with a marshmallow on a stick….its a totally viable way to make smores..I would probably use a longer stick then Junkrat, thus the lost arm…. The only reason it’s not is because there’s too much text for Roadhog to say. It would take forever. Junkrat’s punchline reminds me of a HP/DCAU crossover one-shot. Harry ends up in that universe, in Gotham of all places. While visiting a museum, he sees Joker and Harley trying to rob the place. Harry does the only thing logical: cast a couple of cutting curses from his hiding spot and removes Joker’s hands. Harley quips, “Mr. J, you’ve been disarmed!” Harry, feeling the need to relieve some tension, replies, “I didn’t disarm him, I unhanded him!” This sent Joker into a laughing fit. Maybe he started stress eating after teaming up with junk rat. This is by far my most favorite joke ever. Like, half your stuff would be canon worthy! Woof, might want to go a bit further m8. I expected something amusing. I was not disappointed. But now I remember that one joke from Jim Norton, and I hate laughing at that joke, but that just makes me laugh more!